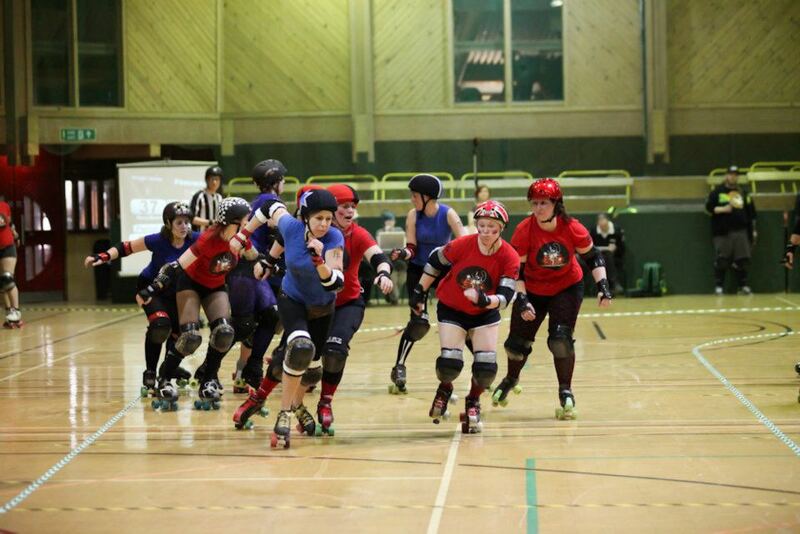 In an exciting double-header event in March, the first bout we were treated to saw the Whippin’ Hinnies face off against the Furness Firecrackers for Daylight Slayings. 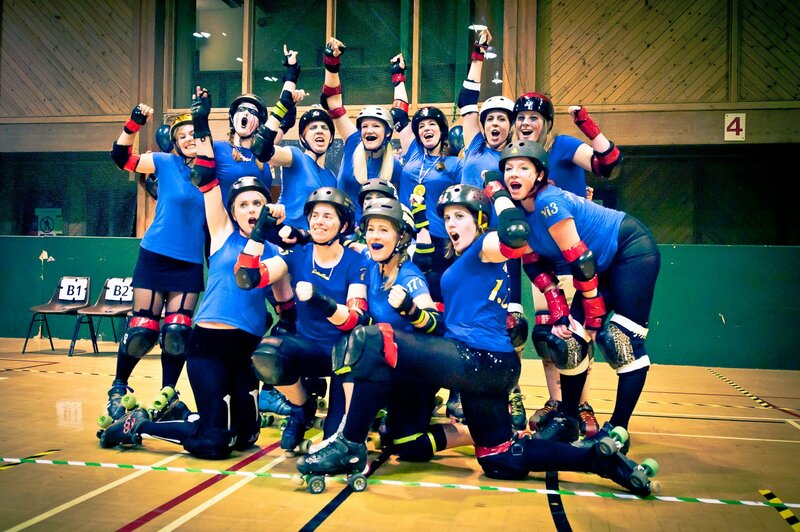 Formed in Barrow in 2010, the Firecrackers are, much like NRG, rapidly building a solid reputation in the roller derby world, steadily spreading their wings to further regions of the country. The Hinnies went into this bout with a good old-fashioned mix of experienced pros and some shiny derby debuts, and it certainly made for an entertaining and rewarding game. The first period saw the Hinnies take a storming lead with a confident team performance. Steady jams from Guinefear of Jamelot, Penny Bizarre and Carm Like A Bomb meant that the Hinnies grabbed themselves a 28-0 advantage, before Furness finally replied in the seventh jam. A bit of an attempted revival by the visitors was quickly pushed aside as the impressive Carm continued to add points with every jam. Things weren’t all easy going however, as the 10th jam became somewhat of a battleground, with the Firecracker’s Hell For Heather and NRG’s Méli McSly both being sent to the bin, but this wasn’t enough to slow the Hinnies down, as Penny Bizarre persevered throughout, giving the home side a 52-6 lead. The Firecrackers again attempted fightback in the final four jams of the first period, building momentum with steady performances from Doh!, but the 13th jam treated us to a key point in the bout. With Furness looking to progress from some encouraging jams, their efforts were blown out of the water by a fantastic block on Meaner Simone from Levine Dead, the culmination of some great work by the pack, eventually allowing Carm to burst through for lead jammer once more, taking the total to 65 -11. The final jam of the first period was equally as riveting, with both jammers battling it out, both adding points, and both ending in the bin. With the start of the second half came a proper knuckle-down session from both teams, as the Firecrackers pushed the Hinnies with some great jamming efforts. Between the first seven jams of the second half, the Hinnies were limited to 15 points, succumbing to fantastic jamming by Doh! and Steffinately Maybe. However, the home side rallied once again, dominating the next seven jams, thanks to some determined work by the pivots and their packs, capped particularly with a key block on Doh! by Blackjack Belle, halting any further Furness progress at 109-57. 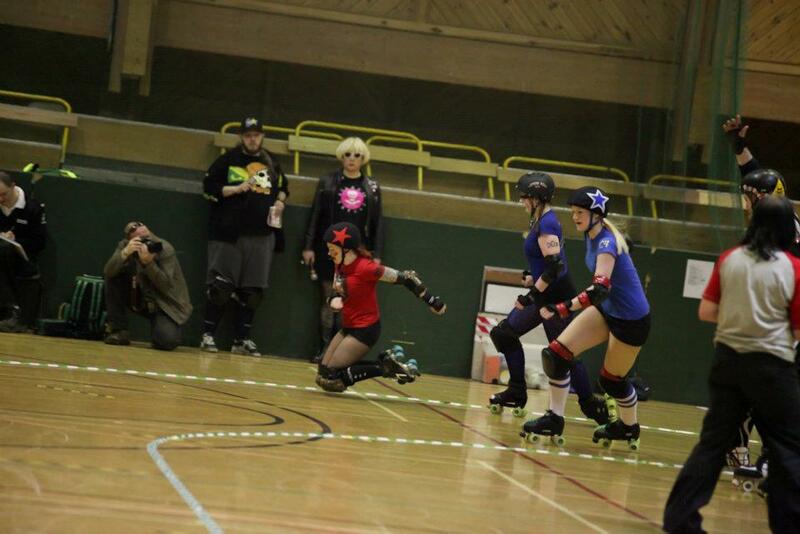 The final jam of the bout was quite probably the best of the lot. With the Firecrackers going for broke, offering an extremely spirited performance for pride,the Hinnies closed the game in style as Elizadeath Benhurt slammed Steely’ll Kill’her, the Furness jammer down at the last opportunity, clearing the way for Penny Bizzare to claim a 28 point jam. Fantastic end to a thrilling game, and a truly convincing performance from the Hinnies.